Answer: You didn’t really ask a question, but you did give me the opportunity to debunk a supposed “photo” that’s been circulating around the internet for several years now. I do enjoy (real) astronomy photos. Everyone I know is aware of that. So over the years, I’ve received dozens of copies of this image from well-meaning individuals. The simple rebuttal is: This never happens. The image is not a real photo, but it’s been let loose on the internet where it seems to have taken on a life of its own. It’s sometimes described as a photo from Antarctica, and other times the Arctic. 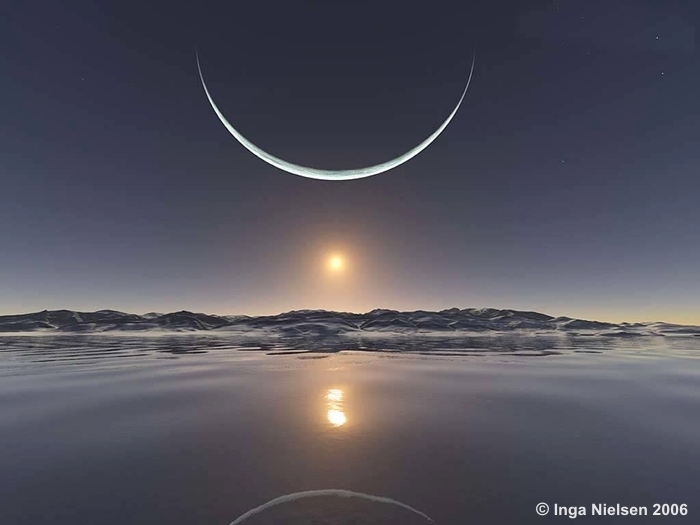 The accompanying text has evolved over the years, but often mentions the midnight sun phenomenon, as though that has something to do with how large the Moon looks. This hoax was first debunked by Snopes back in 2005, and by APOD in 2006, but survives online and misleads many people. Next time someone sends you this image, send them to Snopes, APOD (or Sky Lights) to set the record straight. I have to admit, it really is a stunningly beautiful image. But it’s a purely digital work of art by one Inga Nielsen, a German astrophysicist. See it in her online gallery here. She’s done a lot of these “digital landscapes,” and most are available as posters, so you might want to spend some time browsing her creations. It’s unfortunate that this image was “hijacked” and used to disseminate a hoax. You won’t see the copyright notice on the version that’s circulating the internet. I added that notice out of deference to the artist. Scientifically speaking, there is absolutely no way the Moon could look that large compared to the Sun … unless the Moon were about to collide with Earth. And that’s just not going to happen. There’s a simple formula that lets you calculate how big any object will look (Θ), based on its size (D) and distance (d). Here’s the formula: Θ = arctan(D/d). The “arctan” function is also known as the “inverse tangent” function, which is written mathematically as “tan-1“. That function is used in geometry and trigonometry to calculate the size of an angle. 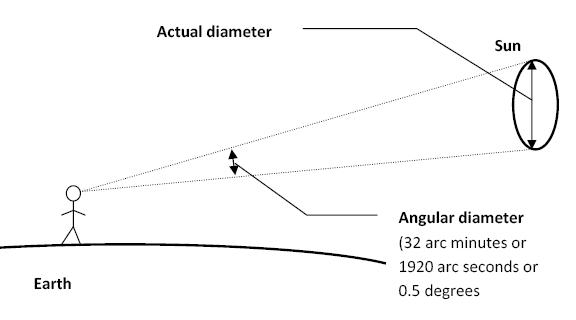 When astronomers describe how large something appears in the sky, they usually use a measure called angular size (Θ). That symbol is the Greek letter “theta.” Its the angle from one edge of the object, to your eye, and back to the other edge of the object. As seen from Earth, both the Sun and Moon have an angular size of about 0.5°. That’s a pretty small angle. It’s the same angular size as an average adult seen from a distance of around 200 meters (650 feet), or a grape held at arm’s length. Click on the thumbnail below for a simple graphic explanation of angular size. 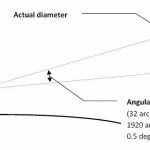 We use angles to measure the size of celestial objects, since you can’t just hold up a ruler and get a measurement in centimeters or inches. Well, you could, but the measure you get would depend on how far from your eye you hold the ruler. The Sun is 400 times larger than the Moon. By coincidence, it’s also 400 times farther away. That explains why they both appear to be about the same angular size, and it’s also why eclipses are possible. If the Moon were smaller, or farther away, it couldn’t cover the Sun completely as it does during an eclipse. For the Moon to appear as large as shown in Nielsen’s image, it would have to be 20 times closer to Earth than normal. If it ever did get that close, the results would be truly catastrophic. Earth’s gravity would rip the Moon apart, and we’d have one huge meteor shower. I should note that the Moon does vary slightly in its distance from Earth. I’ve written about that a few times in Sky Lights. For example, see my Nov 12 or May 21 posts. But its apparent change in size is a mere 14%. While I’m on the topic of astronomy hoaxes, I should also mention another one that’s been circulating on the internet for even longer. 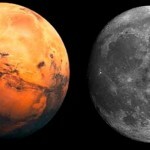 It’s about how Mars will be so close to Earth that it will look as big as the Moon. Click on the thumbnail below to see that image. It’s basic digital photo hacking, combining two images at different magnifications, and is also not real. Please, dear readers, stop sending me copies of these two hoaxes. Let’s at least find some new hoax to debunk.